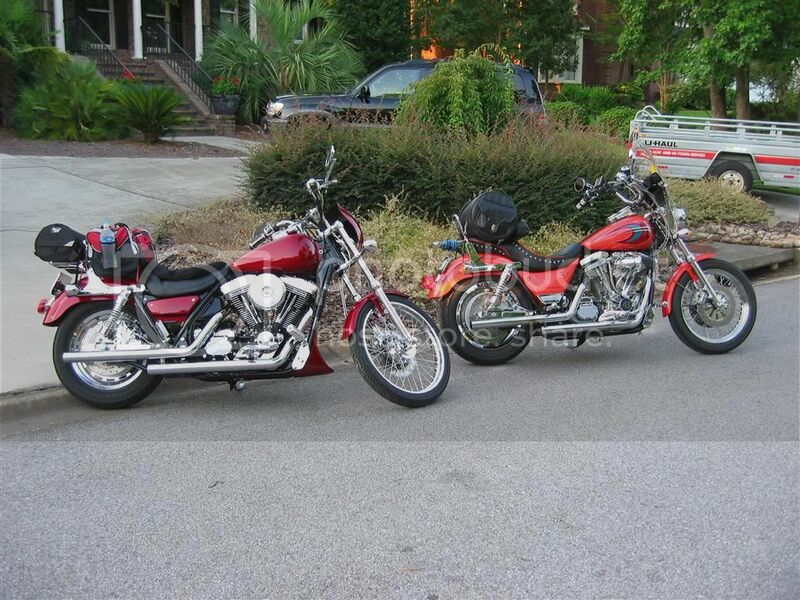 the FXR 2&3 were made in 1999 and the FXR4 in 2000. Hey, what's with all these FXR come latelys. The FXR2 and FXR3's were OK, but HD never did get that the FXR was more about performance than looks. The FXR4 finally caught on with the dual disks, bigger tires, etc. I'm HAPPY to see all the FXR's !!!!! Here's an attempt at a more artsy shot. I've never scraped a peg, half because of a lack of talent as a rider, and half because the Sport has an extra inch of clearance over a standard FXR, and probably two over the lower models. You can actually see daylight between the top of the rear tire and the fender on mine, a mortal sin according to Willie G.
My rear shocks are roughly 14" unloaded, but you have to be careful. The sport model with the longer shocks and forks also has an extra degree of rake for stability and a longer jiffy stand for parking. The extra degree of rake is counter-intuitive for handling, but it works really well in long sweeping turns which is where the bike is best. OH MAN !!!! I want one of those !!!!!!!!!!!!!!!!!!!!!!!!!!!!! Let me add that the 'Live to Pose' derby cover came on the bike and is now history. 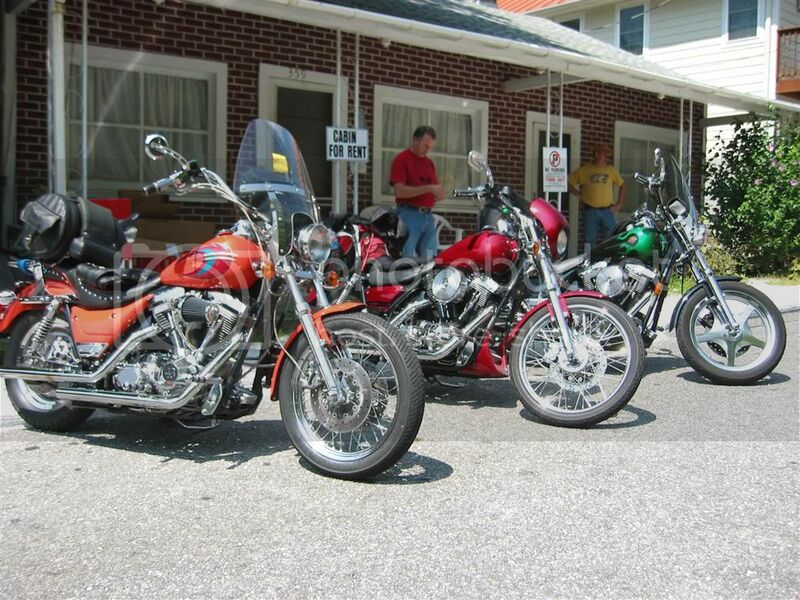 . .
Also, I love all these bikes; cop, hotrod, bagger, and cruiser. I've drooled over Mikey's FXR4 more than once. The purposeful purity of cwilk's 'RT is right up my alley. 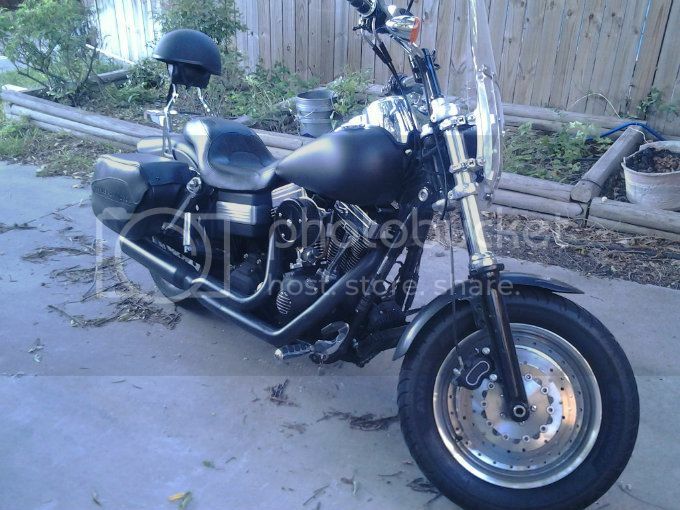 If anyone ever has a set of those FXR4 triangular frame covers for sale, please let me know. Last edited by Homesick; 08-23-2010 at 03:42 PM. When I bought mine I had to replace the air cleaner cover, derby cover and both mirrors for that exact same reason. I've never liked the triangular covers, I've always preferred the inside the frame covers instead. I hear the triangular ones are hard to come by. They're rare enough that Rick (I think), on 'Pawn Stars', would want three guest experts to check a pair before he bought them. ''You know, I've heard of these, but never actually seen a pair. The Old Man thinks I'm crazy, but. . . if they're real, I'm going for it. I just have to make sure I can make my million on them''. My 92 FXLR. Sporting a fresh S&S107 motor.